Welcome to episode 4 of the ‘What Would Sharon Raydor Do?‘, the podcast devoted to getting an in-depth view at Major Crimes Captain Sharon Raydor by the woman who knows her best, Mary McDonnell. This weeks episode discusses episode 504, “Skin Deep”, and features guest host Andy Flynn himself, Tony Denison! Welcome to episode 3 of ‘What Would Sharon Raydor Do?‘, the podcast devoted to getting an in-depth view at Major Crimes Captain Sharon Raydor by the woman who knows her best, Mary McDonnell. Welcome to episode 2 of ‘What Would Sharon Raydor Do?‘, the podcast devoted to getting an in-depth view at Major Crimes Captain Sharon Raydor by the woman who knows her best, Mary McDonnell. We will be including a few listener questions on the podcast each week – ask your questions below, or tweet them to us @MaryMcDonnell10 and @MajorCrimesTV using hashtag #WWSRD, and listen next week to see if your question has been answered! Chelsea: It started with ‘What Would Laura Roslin Do?’ And now we’re asking “What Would Sharon Raydor Do?”. Welcome to the all-new “What Would Sharon Raydor Do?” Podcast, where we’re looking to get an in-depth view of Sharon Raydor from the woman who knows her best. I am here with Mary McDonnell who plays Sharon Raydor on TNT’s Major Crimes and we are looking into her character and analyzing a little bit of this week’s episode that you hopefully saw last night. And that episode is episode 1 of season 5 called “Present Tense” and… Hi Mary! How are you? Mary McDonnell: I’m well Chelsea! Chelsea is a veteran member of Team BAM. So quite often when Team BAM is tweeting, now you’ll have a voice associated with some of those tweets. 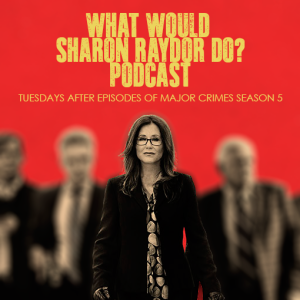 Welcome to ‘What Would Sharon Raydor Do?‘, the podcast devoted to getting an in-depth view at Major Crimes Captain Sharon Raydor by the woman who knows her best, Mary McDonnell.